14 Karat Gold - Miss Mustard Seed Glitter - 4 oz jar We are happy to announce a great new line of Glass Glitters, a special blend designed by Marian Parsons, better known as Miss Mustard Seed! 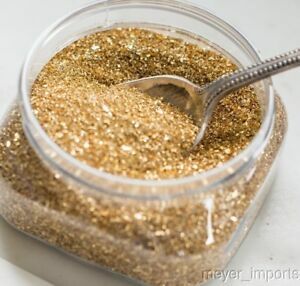 We are offering Miss Mustard Seed's 14 Karat Gold German Glass Glitter in a 4 oz wide-mouth jar. Ready to be sold in retail sales, or for the customer who just needs the best supplies available. This Glass Glitter is made in Germany for Miss Mustard Seed and starts with real silver coated glass and a process that has not changed for a 100 years.